Hang out with an EV Expert and Test Drive EVs this Week! The Northern Colorado region is unique for its ability to bring together communities, creating an active, fun, artistic, and innovative culture. Drive Electric Northern Color ado is proud to be a part of this culture with an innovation of its own—electric vehicles (EVs). Over the last few years, the number of EVs on the road in Fort Collins and Loveland has grown immensely, as has the number of charging stations. With DENC’s help, The Northern Colorado region is fast becoming a national leader in EV deployment, installing over 20 charging stations and advancing regional EV sales that were 42 percent higher than the national average by the end of 2013. By deploying EVs and reducing our community’s oil consumption, we will not only improve and protect our beautiful environment, but we’ll also reduce our dependence on oil, a fuel that leaves our economy vulnerable to an often-volatile global oil market outside our control. As the weather starts to cool down and the leaves are changing here in Northern Colorado, DENC partners are using the fall weather and colorful streets to roll out opportunities for community members to test-drive EVs through DENC Ride and Drives. Drive Electric Northern Colorado, Odell Brewing Company, and the Fort Collins Downtown Business Association (DBA) would like to invite you to our upcoming community events on Oct. 10-11. The weekend will kick off at 7:30 p.m. – 8:30 p.m. on Friday, October 10 at Odell Brewing Company with a “fireside chat” with the Electrification Coalition’s own Tony Posawatz, the man behind the Chevy Volt. 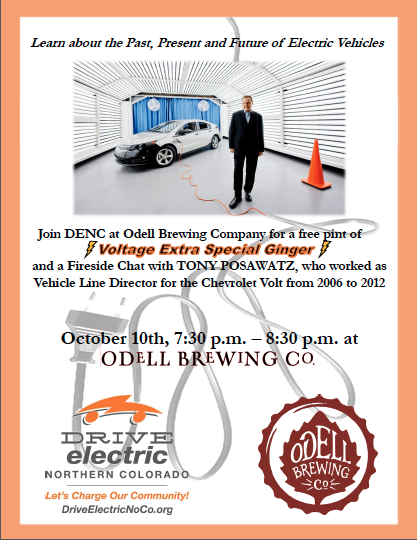 While you cozy up with a free pint of Odell EV inspired beer, “Voltage,” Tony will share his perspective on how EVs can become widely adopted, how today’s EV technologies have improved since earlier models, and how deployment communities like Northern Colorado are critical to accelerated EV adoption across the United States. As vehicle line director for the Volt from 2006 to 2012 and an automotive leader for General Motors since 1980, Posawatz is a nationally recognized expert on the challenges and solutions of EV deployment. This opportunity is open to the public and free of charge, so please come join us! 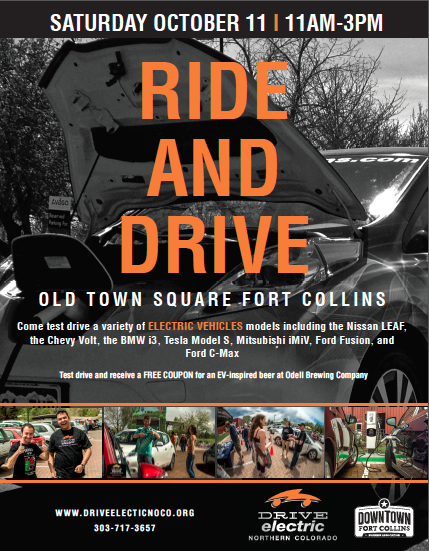 The following day, October 11, DENC and DBA will be hosting a ride and drive event in the Fort Collins Old Town Square. DENC and the DBA will provide the chance to test drive a variety of EV models including Tesla’s Model S, BMW’s i3, Nissan’s LEAF, Ford’s Fusion Energi, Mitsubishi’s i-Mi EV, and GM’s Chevy Volt. DENC will bring as many as six EV models for event-goers to drive and compare, in order to find the model that fits their lifestyle best. Local EV owners and enthusiasts will also be on hand to share their experience with EVs and answer your questions. Drive an EV and receive a coupon for a free “Voltage” EV-inspired beer brewed by Odell Brewing Company, a free bowling game at Chipper’s lanes, and be entered to win a $100 downtown gift card. Additionally, DENC will be represented at the Cross of the North event on Oct. 10-12. Stop by our booth to learn more about EVs and find out which one will work best for your lifestyle. Produced by the Fort Collins Cycling team, Cross of the North is a three-day cycling event that showcases the active Larimer County Lifestyle. The event will not only feature the opportunity to drive a variety of electric cars, but you will also be able to enjoy bike racing, a kid’s zone, a vendor expo and more. The ride and drive will take place on Sunday October 12 from 12:00 p.m. – 3:00 p.m. This weekend is going to be a busy one for DENC, and our team is looking forward to engaging with our community. Drive Electric Northern Colorado is committed to creating an enthusiastic network of EV owners throughout the Northern Colorado region. If you are considering how an electric vehicle might work for you, we’ll be happy to speak with you at one of our upcoming events. Stop on by with questions, conversational interests, or to get behind the wheel of an electric vehicle yourself. We look forward to seeing you there! To volunteer for any of these events, click here or to get involved with any of our other upcoming events, please visit our website at http://driveelectricnoco.org/upcoming-events/.